stimulation and normalization of energetics in this area . allergic reactions to beekeeping products . 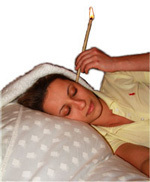 Natural components of the ear phyto-candles provide anti-inflammatory, anesthetizing and spasmolytic action without by-effects . and activation of the lymph current. Treatment can successfully be held at home . Beeswax, propolis extract, cotton, composition of curative herbs . In the day of procedure it is no need to wash your heir because of prevention of water entry in the auricle . In case of chronic diseases 5-6 procedures are recommended . 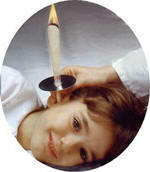 Bio ear cleaning – 20 lv . Working hours - 10 – 17 h . ( 20th of April – 20th of October ±10 days).